CT utilization volume growth has leveled off after more than a decade of rapid growth, but when combined with ever-improving image quality, it's inevitable that radiologists are discovering more findings unrelated to the reason the exam was initially ordered. According to Lincoln L. Berland, MD, FACR, vice chairman of quality improvement and patient safety at University of Alabama at Birmingham School of Medicine, incidental findings have become so ubiquitous that they've earned their own nickname: "incidentalomas." Incidental findings can lead to not only increased utilization of imaging but also unnecessary risk to patients, especially if the follow-up study involves ionizing radiation or other intervention. In the era of the Affordable Care Act, providers face growing pressure to contain health care costs and avoid unnecessary studies, imaging or otherwise. The most common reason physicians pursue incidental findings is to differentiate benign from malignant lesions; yet, Berland says, most incidental findings ultimately prove to be benign. At the same time, many radiologists worry they could miss the one incidental finding that is important and in doing so be open to malpractice charges. Against this backdrop, a promising new tool is in development; it may offer radiologists better guidance as to when they should recommend follow-up on an incidental finding and when to just say no. At RSNA 2014 in Chicago this past December, Nuance Communications announced that the ACR and Massachusetts General Hospital (MGH) would utilize the Nuance PowerShare Network to bring clinical guidelines to the radiologist's workflow. According to Nuance, one-half of the radiologists in the United States create their reports with the company's speech-driven PowerScribe 360 solution. "Through our conversations with both the ACR and our clients," says Christy Murfitt, director of diagnostic solutions marketing for Nuance, which is based in Boston, "we recognized that as the industry moves from fee-based to value-based care, the need has grown for more clinical guidance and consistency in recommendations to drive better outcomes." The ACR Incidental Findings Committee, of which Berland is a past chair, has published six white papers in the Journal of the American College of Radiology on recommendations for managing incidental findings. "But that's as far as they go," Murfitt says. Radiologists at MGH have taken this one step further by creating what she calls a great system for applying these and other non-ACR guidelines at the point of interpretation to promote better outcomes. Previously, within MGH, the recommended guidelines and other white papers were PDF documents that radiologists sometimes printed and taped to their workstations to use as reference. Improving that workflow is where PowerScribe 360 has stepped in, Murfitt says. "There is great information available to radiologists in various locations and Nuance has a vehicle to make it accessible and bring it directly into the radiologists' workflow in real time. We can make those guidelines a part of the way the radiologist practices and really make those critical guidelines useable, driving consistency of reports and improving the quality of care provided," she says. MGH is a beta site. When the Nuance Clinical Guidance tool launches, radiologists who come across incidental findings won't have to rely on their memory or search for and download the paper that has the guidelines they need, says Tarik Alkasab, MD, PhD, a radiologist at MGH, who is working with Nuance and ACR on the project. "When Nuance Clinical Guidance is in place, radiologists reading a chest X-ray or chest CT will say, 'There's an incidental finding of an adrenal nodule.' Within PowerScribe 360, a window will pop up that will let them dictate some quick descriptors of the nodule they see. The descriptors include what size it is and whether or not it has the diagnostic features that would indicate whether it is one of the 'nothing' kind of incidental findings, or whether it may be something that warrants further investigation," Alkasab says. The tool will generate the exact language that it recommends the radiologists include in their reports for this finding. "That's the magic of it," Alkasab says. "It recognizes the situation the radiologist is in and is able to produce real, useful standard guidelines for the patient's record." The Clinical Guidance tool will include modules that are based on published guidelines and consensus, offering guidance for vascular abnormalities and for incidental findings, such as those in the liver, spleen, pancreas, ovaries, kidneys, adrenal glands, thyroid, and gallbladder. The majority are based on published ACR guidelines. The guidelines for the management of small pulmonary nodules seen on CT are updated from the Fleischner Society's and the guidelines for management of asymptomatic ovarian and other adnexal cysts imaged on ultrasound from the Society of Radiologists in Ultrasound. The guidelines that have been developed for the launch are consensus documents, Berland says. The consensus is based on the literature—if literature is available. "If there is no data that says: 'This is what you should do,' we organized a group of expert radiologists in conference calls who came up with conclusions about all these things, providing expert opinions even where no scientifically researched evidence is available," Berland says. Most of the guidelines are for findings on CT and MRI scans, but they are not limited to these modalities. "It's just that CTs and MRIs are exams where you commonly see incidental findings," Alkasab says. The incidental findings that were addressed first were those that radiologists most often see. "Most were developed on abdominal and pelvic imaging," says Berland, a body imager, "but there are a number of other areas where incidental findings arise and we're looking at ways to include them as well." Some areas that Berland expects to add in the near future include musculoskeletal imaging, neurological imaging and chest imaging. "We're also looking at seeing a breast mass on a chest CT," he says. "Those kinds of things are in development." Berland anticipates the number of guidelines to proliferate over the next several years, and, as more research is completed, for them to be updated accordingly. Alkasab says he wouldn't be surprised if the number of modules doubles or triples by the end of the year. MGH has committed to developing another 20 this year and another 40 a year for the next three years. He is hoping not just Nuance and MGH will expand the guidelines, but that numerous radiologists develop modules and load them onto their framework, use them in their practice, and share with their colleagues. "The way it looks on the screen, the idea is to create a consistent look and feel that will fit in well to the workflow of PowerScribe 360," Berland adds. Because it's a cloud-based program, with Nuance PowerShare, as more information on guidelines are developed, they can be updated and added seamlessly to the program. "If it's all computerized and if you have a national network like PowerShare updating in the background, anyone who subscribes to the service can have this pushed to them," Berland says. Murfitt says Nuance is actively working on usability with customer advisors before its launch, which she anticipates will be this spring. The guidelines are, of course, optional. 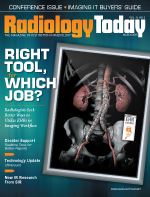 "Radiologists have the discretion about whether to use these tools and can use their judgment as to when the tool is appropriate or not for their specific clinical situation," Alkasab says. Alkasab suspects the Clinical Guidance tool will be most useful for general radiologists and for subspecialists when reading outside their area of specialty. For example, he says, MGH has top-notch thoracic radiologists. "They don't need the tool to say the right thing about lung nodules all the time," he says, "but they're very grateful for the tool that helps them say the right thing about adrenal nodules. The same applies to our division of abdominal imaging here. The radiologists who specialize in abdominal imaging may not always need it for abdominal images, but are grateful for the tool that helps them say the right thing about pulmonary nodules." Research shows that physicians who use evidence-based guidelines are less likely to order extraneous examinations. Yet, Berland says, few apply guidelines and translate them correctly to their reports. "What we're doing here is trying to make sure that everyone's doing the same thing so we can improve the quality of care," he adds. "The papers are basically consensus-based and may not be 100% correct." He hopes the information from them will be used as a foundation upon which to do more research as to exactly how they optimize care. As the former chair of the ACR's incidental findings committee, Berland says he started the project several years ago because physicians seemed to be ordering tests "willy-nilly" out of medical-legal concerns. A culture of certainty, which seems firmly established in medicine, has developed, he says. "There's this feeling on the part of both patients and referring physicians and radiologists that you have to be 100% certain about whatever you see. Certain incidental findings occur in almost everyone. So if you follow up on everything you're doing, too many exams, which provide risks to patients, are ordered." Thanks to today's technology, the old adage, "better safe than sorry," just doesn't always apply, Berland says. "You're probably a lot more sorry than safe in a lot of these situations when you order follow-up exams and biopsies, and what we're trying to do is differentiate those." The Centers for Medicare & Medicaid Services has said that effective January 2017, referring physicians must use physician-developed appropriateness criteria when ordering advanced imaging for Medicare patients. The regulation is an effort to reduce duplicate and/or unnecessary scanning and associated costs. Berland and Alkasab expect the Nuance innovation project, called the PowerShare Innovation Program, to garner the attention of third-party payers as well. Berland says he wouldn't be surprised if insurers were to say they will cover the investigation of incidental findings if the radiologist applied the appropriate guidelines and concluded follow-up was necessary. "That may well be a step down the road," he says. At MGH, Alkasab says, the radiologists are using IT solutions to help demonstrate their value in today's value-conscious world. Using the clinical guidance tool makes it easy for the radiologists to have a reliable record of their recommendations on incidental findings. Down the road, he says, the radiologists could say out of the hundreds of thousands of reports they wrote, they saw a couple thousand adrenal nodules or solitary pulmonary nodules, and, based on the guidelines, see whether they made too few or too many recommendations for follow-ups. If necessary, he says, they could adjust the rate at which they made recommendations for follow-up for a particular type of lesion. With this tool, "If you had a population where you wanted to be more restrictive for follow-up, you could reach in and try and change the radiologists' practice," he says. Berland says relying on memory for the recommendations is challenging. "I wrote some of the papers on which the guidelines are based and I can't remember them all," he says. Alkasab says integrating expert clinical guidance through the Nuance PowerScribe tool is definitely better and faster than radiologists having to look at the papers they printed and have hanging from their workstations or need to search for on the Internet. "It's not quite as good as relying on memory and making up the recommendations," he says. "But our goal is to make it almost as good as, if not better than, making up the recommendations from memory. We want to make it as easy as possible for radiologists to do what we know is the right thing and to be consistent." Berland, who is now chair of the ACR's Commission on Body Imaging, expects considerable interest from radiologists in this project. "Every time I give lectures on this at RSNA, we get hundreds of radiologists who come," he says. "It is a very hot topic. It's also very, very practical. It is a true clinical problem that has real clinical implications."